ISI GOURMET WHIP� 1/2 PINT� HWIS1403 The all purpose tool for the kitchen. For the preparation of light and fluffy Espumas, finger food, warm and cold sauces and whipped soups, as well as whipped cream and desserts. For cold and hot preparations. Stainless steel bottle and head - designed for professional use. 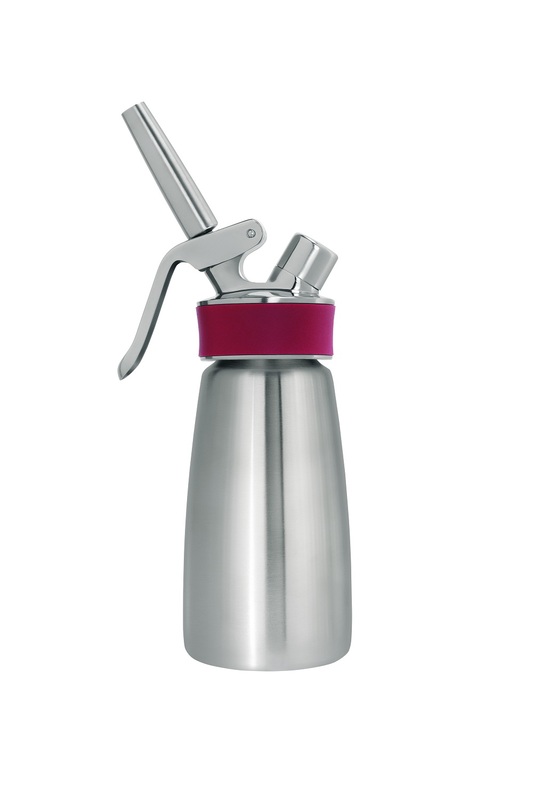 Head with protective silicone grip and fixed stainless steel valve for easy dispensing, even with hot preparations. Heat resistant silicone gasket with removal tab for quick and hygienic cleaning. Keep warm in bain marie up to 75�C/165�F. Three different sizes to suit any kitchen: 0. 5 L, 1 L (1/2 US Pint, 1 US Pint, 1 US Quart) Inclusive: Stainless Steel Straight Tip, Tulip Tip, Star Tip, Cleaning Brush Ergonomic charger holder with non-slip silicone grip Dishwasher-safe NSF-certified Helps meet HACCP requirements 2 years warranty . ISI GOURMET WHIP� 1 PINT� HWIS1603 The all purpose tool for the kitchen.